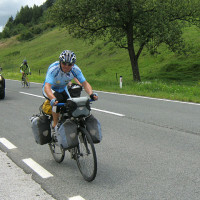 There is a Touring Cyclist Dejan Glavnik, who has “touring the world” more than five years.In this time he has crossed 90 countries on five continents. I have finally meet him and … Oh, boy, did I learned that day ..! I was “Faithless Thomas”, but believe now, when I saw with my own eyes. I was a part of the impressive event, otherwise knowledgeable purely theoretical! While driving for an hour, I saw a famous scenery, seeing so many times in our “secret relationship” on his blog. 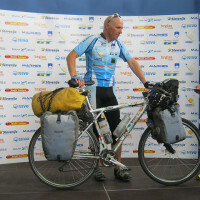 A fully loaded touring bike, athletic built man and his recognizable blue cycle clothing. “Welcome home! Thank you!” were the first words we share after so long time. 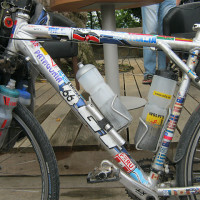 Since most of his days was spent on a bike, he was dictated pretty fast cycling tempo. 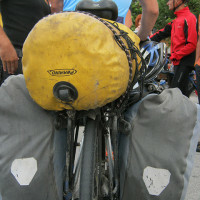 Though fully loaded touring bike, he drove with amazing speed and the boys with ultra-light wheels barely keep up. And so it went all the way to first stop at Troyane, where the events started to intensified. First meeting with relatives, friends and admirers. From his helmet, the sweat literally poured down when I briefly addressed him. Yes, he is real. 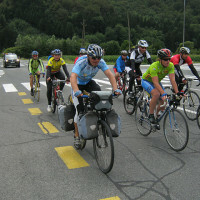 Shortly thereafter, a group of cyclists increased and we cycled towards his birthplace Polzela. Miles accumulate, and our group was growing. The column of vehicles accompanied by photographers and TV cameras. 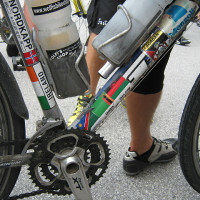 Yes … here’s my heart and mind… in the real world cycling adventure that slides past the rider on the road. With loud applause and monitoring the crowd followed the arrival in his native village Polzela. It must be really nice if you are known and adored by so many people. Recognition of home town officials and the media was a happy event for each of us. He was spiking to the public about responsibility for decisions he had to take. He could easily experienced, shame and a need to apologize himself, why he could’t realize, this or that, and quickly faded into oblivion! But this man has succeeded! And today we flocked to the reception venue to see this charismatic man. 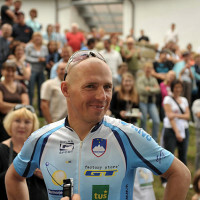 It was a new Slovenian hero, who has done what he promised. 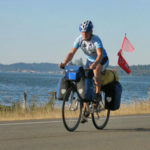 I didn’t spotted none of bike travelers, so I was the only guy with bicycle touring knowledge and gladly helped out with advice if anyone was asking. With witty speeches, Dejan Glavnik has inspired us. Describing the simple ways in which he held his life on the road. It sounds simple, from his point of view … but for me, it isn’t! Much knowledge about equipment and so many other things and logistics is necessary. The hardest part is to start! For doing this, you simply must have a felling, that you can do it! Touring the world is a self-absorbed event, pointing you to the fact, that you do not changing the world, the world changes you! Those who do not accept, or timid, let them better stay at home! A simple advice for another side of the story! It’s not easy if you’re many years nurturing a cult of an ordinary man. It is necessary to leave behind everything. Job, home and family … all what we are used to call everyday life.Talking about denunciation and transformation, is also familiar to great enlightened individuals who understand the nature of things and the illusion of time. It is necessary to leave all, what is known and there is no guarantee for refund of what you have invested. No “Reise-Checklist” does not help here ! But things start to get more clearly, when you’re already well into the process of journey events. A first step is to make a decision. The more firmer this decision is, the more it adapts to our everyday twitching and work! 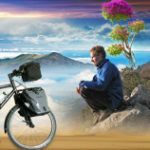 How to motivate and make decisions in our life is not what we learn, at least not up to this limit in order to be happy. Our diversity is missing just that. We are looking for big solutions, because we do not want to admit, that some things are maybe just not meant to be. What things? Have we already tried? If this yearning is within, it must reveal itself somehow in practice! How it got there and why the yearning persists for so many years, is another issue. I wonder just how much longer we can endure in a position of – always with a tiny fraction of the mind on starting to live our dreams! If, for many years we had excuses and moral obligations to the families we created, NOW it’s time for change and we can be free! Although the cage has been open all the time! And another charismatic hero is fused with everyday life and settle down. Let fate be friendly to him,for enough he did. We are already found new heroes and quietly hope to join them soon. Then when we starting to give birth to our experiences in a foreign world and in a foreign heart, then surely we will be at the right place.